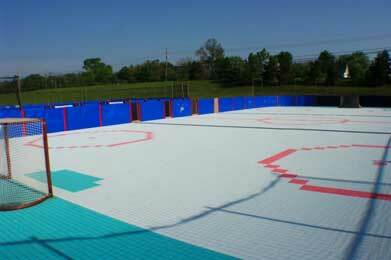 SWG Inline Skating tiles represent the very latest in design and technology for indoor and outdoor hockey. Both SWG’s indoor and outdoor surfaces provide a unique combination of fast puck speed, low abrasion and consistent skating properties. The SWG Inline Skating Tile features a high-density rib pattern for tremendous durability under the most demanding conditions. The innovative flex joints of the SWG Inline Skating Tile allow the surface to be fastened tight to the board system to insure a no-movement, no buckle surface from the hottest to the coldest climates. Both indoor and outdoor products offer 15 standard colors. Game lines may be done in a tile for low maintenance flooring or may be painted for a more traditional look. Whether it's indoor or outdoor your investment in the best modular surface is fully backed by the first and oldest name in the business.